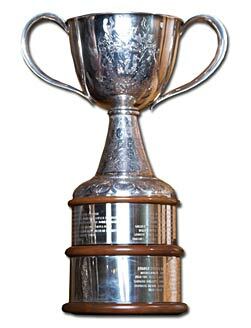 The Clarkson Cup, named after former Governor General of Canada Adrienne Clarkson (1999 to 2005), has served as the Canadian Women's Hockey League championship trophy since 2009. The champion is regarded as the top women's team in the country and the trophy viewed as the Stanley Cup of women's hockey. The inaugural winners of the trophy were the Montreal Stars who defeated the Minnesota Whitecaps. Madame Clarkson was on hand to present the trophy to the victorious Stars. The trophy itself consists of a loving cup, which is engraved with the coat of arms of Governor General Clarkson. The pedestal is engraved with hockey masks and the base with flowers of each province in Canada.